An invitation is extended to all past Priests, Sisters, Teachers, Students former Parishioners along with current Parishioners to come together to celebrate 100 years of the Catholic Faith in the Brunswick Valley. 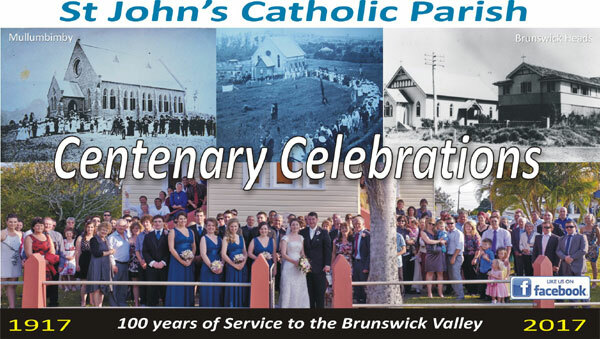 St John’s Catholic Parish will be hosting the Centenary Celebrations on Saturday September 30 to Sunday October 1, 2017. 5. Vigil Mass with the Bishop Saturday 5.00pm at Brunswick Heads. Light supper after Mass. 6. Sunday Mass to be held at 8.00am at Mullumbimby. 8. Centenary Historical Display to continue in the School Hall until 12.00noon. Add your surname as reference. We look forward to you joining us for the Centenary Celebrations.